Once or twice I've mentioned my happy infatuation with Purex Crystals and how I like to use it in every wash load. I love, love, love the long lasting fresh scent the Purex Crystals provide. Stinky socks ... no problem, they come out of the wash smelling better than new. Towels left on the floor smell fresh and clean after washing, instead of having a mildew odor. T-shirts in a drawer for weeks smell wonderful. Well, we ran out and I've been waiting, impatiently, for a BOGO to buy more. In the meantime, our laundry is not smelling anywhere near as super awesome as it used to. 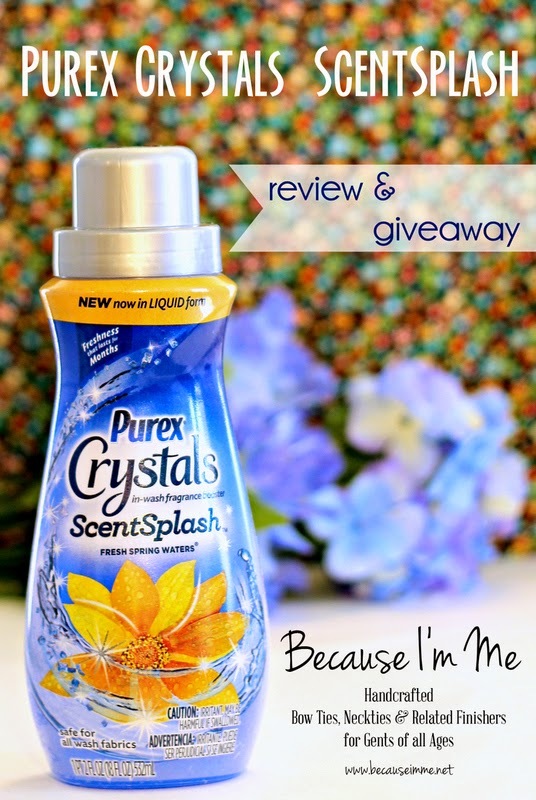 When I was given a chance to try and review new Purex Crystals ScentSplash I was thrilled! ScentSplash is new to the market, becoming available April of 2015. This is a liquid in-wash fragrance booster, different than the previous shake-in crystals. Three scents are available; Fresh Spring Waters, Fresh Lavender Blossom, and Fresh Mountain Breeze. I was given the Fresh Spring Waters scent to try. For the first load I used about half a cap full, probably about 3 tablespoons worth, in a full load of laundry. That, for me, turned out to be way too much. The scent was a little flowerier than I'm comfortable with and was very strong. For the next load I used just a tablespoon or so of the product. Perfection. The clean laundry smells great, is a much more comfortable amount of scent, and using less took the scent from "flowery" to clean and refreshing. Using such a small amount means this a bottle of this will go a very long way. It's very easy when folding the laundry to tell which items were washed with the liquid crystals. Even with a fabric softener sheet in the dryer, the clothes washed with the crystals smell fresher and cleaner. Would you like to try Purex Crystals ScentSplash for yourself? Well, you're in luck! Enter below to win coupons for two free bottles of Purex Crystals. Good luck! The Purex brand provided me with a sample of Purex Crystals ScentSplash in exchange for a product review. However, all the opinions expressed here are my own. My favorite scent is Fresh Lavender Blossom. Fresh Lavender Blossom would be my favorite. We use Mountain Breeze for everything, so that would be my favorite. My favorite is the Fresh Mountain Breeze. I'd love to try the lavender scent. Interesting. I've tried the Lavender, Fresh Waters, and Baby scents in the crystals and they all smelled lovely. Thanks for sharing about the new product! The Fresh Mountain Breeze has a great name. I hope it smell just as nice. I'd like to try the Fresh Mountain Breeze. I've tried all the scents in different products that Purex has, but for the liquid, I think I'd like the mountain breeze scent best. I like the lavender blossom scent. I like the Fresh mountain breeze scent. It sounds wonderful.